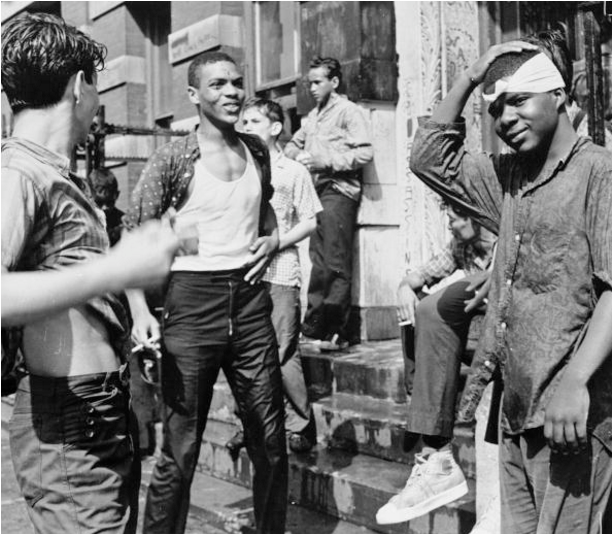 There were two Assassins gangs in Manhattan during the 1950s, one in West Harlem and the other in Central Harlem. The two gangs didn’t associate much on account of the distance between them. The Assassins in Central Harlem fought the Scotchmen, also from that area – click here to read about that. The Assassins in West Harlem were mortal enemies with the Sinners (sometimes referred to as Young Sinners) also from West Harlem. Their rivalry flared white hot in the summer of 1959 in a battle culminating in the death of one member of the Sinners (Milton Graniela) in a police shoot-out next to Central Park, and the killing of an Assassin (Sergio Quinones) in a drive-by shooting, all in the same day. After the unfolding of this tragedy, I have only come across one other reference on record to the Sinners and none on the Assassins. This isn’t exactly a surprise though because often in extreme events like homicides, the police pressure on the neighborhood was intense and it sometimes spelled the end of that particular gang. Or sometimes the gang collapsed because so many of it’s members were incarcerated. Whatever the reason in this case, as mentioned, I wasn’t aware of any references to the Assassins from West Harlem after these killings. That is until I received a message the other day from a reader on this website who sent a fantastic picture taken in November 1961 of Juan Vasquez, the Vice President of the Assassins at 101st Street, the headquarters of the gang. This is a great picture and now we know that the Assassins survived the violent summer of ’59 and lasted until at least November 1961. Vice President of the Assassins. 101 St Harlem.